Did anyone tell you how therapeutic baking can be? Well I’m telling you now. Ever since the new semester of school kicked in, I’ve been so busy that I haven’t had time to bake or cook as often. My oven was under-utilised, there wasn’t any nice aroma emanating from the oven and absolutely nothing to experiment with. So yesterday when I had some time to spare in the evening, it’s no surprise what I did. Don’t mind the black & white effects. I was bored so tried to play around with Adobe Photoshop. Anyway I was really craving for some homemade biscotti. 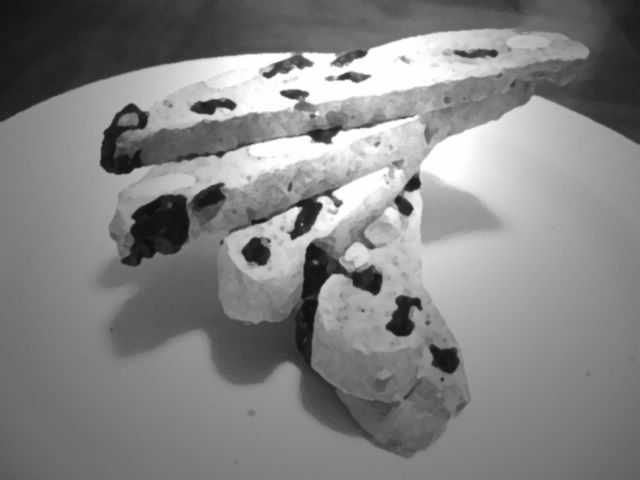 There’s something about biscotti that’s so simple, yet so elegant. Whenever I think of biscotti, I think old school – people sitting around in cafes, dipping their biscotti into a cup of cappucino, hot cocoa or latte. 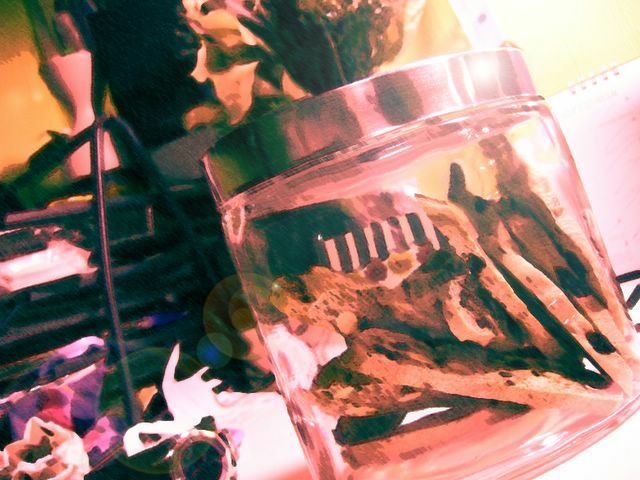 It exudes that sense of serenity, where people slowly wait for their crisp biscotti to soften in their hot drink then bite it. The only other biscotti I’ve made is the almond biscotti; that’s the most common one I guess. Almond biscotti sounds sophisticated and does certainly taste so. To me, it has character. I’m someone who doesn’t crave for uber fanciful things so maybe that’s why. I guess the recipes I choose reflects me and my preferences. Going back to basics is so me. Probably that’s why I adore anything vintage, rustic, country and raw stuff. I have that vision for my bakery – in the future that is. Maybe I’ll have a shop just like what Samsoon did in My Lovely Samsoon. Hers was an online pastry shop but she also had a physical store where customers can come and collect their orders. Hmmmm… I can’t wait till the day that happens. But first, I gotta concentrate on school! **the baker’s note: i halved the amount of sugar because I don’t like my biscotti too sweet. anyway the raisins are sweet already. Epicurious I love that page, I discovered it fron the tv show and is like my go to web page whenever I need a recipe, btw biscotti looks yummy. I usually make my biscotti with no sugar at all and use them as crackers for dips. yes! i totally agree with you about how therapeutic baking can be. it’s the entire process of starting from scratch right up to the point where the people you offer your baked goods to say that it tastes good. i love baking early in the morning or late in the night cause i love it when the only sound you can hear is the machine at work and the sound of your own thoughts and i am all alone. these difinitely taste good with a cuppa of latte. I love using that effect on Photoshop, is it something like watercolor or the like? 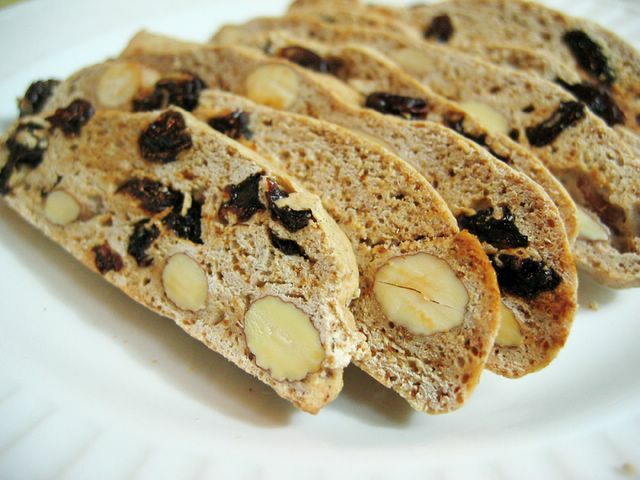 Well your biscotti look gorgeous, I love the combination of cinnamon and raisins! Oh, that looks yummy! Plus I’m fasting so everything looks extra yummy. Hehe. You said you halved the amount of sugar – the recipe you posted is the original one, right? Meaning it’s not yet halved? So halved = 1/4 cup. Yes? Just checking. Also, can you suggest a non-alcoholic substitute for brandy? GorditaSabrosa: Absolutely! I do that too… it’s the first site I go to whenever I’m in urgent need of a good recipe. D: yea, i don’t like my biscotti too sweet either. but these ones are really yummy. Angie: yep, i like almonds and I made sure there were plentiful in those biscotti! Precious Moments: couldn’t agree more! i drank it with mocha yesterday… yum! jenjen: yep, i used a bit of watercolour, and tweaked the colours a bit… cinnamon and raisins are a match made in heaven. smells great too! Rose: hey! yes i remember you! you know, you’re the first person to acknowledge me upon recognition. it was a pleasant surprise. haha so sweet. yes, baking is fun isn’t it? what do you like to bake most? I’ve not try this before, the biscotti looks yummy, I like your third photo the texture of the biscotti looks really crisp!! Hee..I’m another person who understands and totally agree on the therapeutic effects of baking. Anyway, your biscotti looks yummy! Cheers to baking! hey, just a quick question: do you know where i can go to get those paper kind of chef’s hat? I was just wondering if you followed the recipe exactly. ive tried making these but the dough turned out pretty dry so i added about 2 more tbsp of brandy, to no avail. the dough split while baking in the oven. could you offer any help? thanks! i was looking for a biscotti recipe, and google brought me to your page. I must say that those biscottis look like a piece of art. About the theraputic aspect of baking: I totally agree. Suring the most stressful weeks of the school year I can be found in the kitchen baking something, anything during my endless breaks where i make snacks that my siblings and i can enjoy. its amazing how when i sit myslef down to study, the next second i’m back in the kitchen dumping things in the kitchen aid! anyway, much success in all ur future baking endeavors!